SOUTHINGTON - The Town Council is looking to hold its first community conversation on equality and tolerance in late February or early March. Councilor Victoria Triano said the council wants to have this conversation quarterly. Triano asked Town Manager Mark Sciota to see whether Connecticut Council of Municipalities had an expert on the topic with whom the council could consult. She also suggested that the Police Department could be part of the community conversation. Triano said the conversation will be open to all and that the public will have an opportunity to comment. Town Councilor Dawn Miceli said the Connecticut Community Foundation had just recently held a similar event. Councilor Mike Riccio added that the council’s nine members would be glad to take phone calls from or meet with residents who have concerns. The council will be offering residents an informal meeting on Wednesday, Feb. 6, from 4:30 to 5:30 p.m. in the finance conference room at Town Hall, 75 Main St.
Council members said the format of the meeting will be similar to the coffee-and-conversation events frequently organized by local legislators. Also Monday, the council approved a request from Sciota for an extension in the deadline for presenting his budget to the Board of Finance. The Town Charter dictates that the town manager must present his budget to the finance board on Feb. 18. Sciota asked for an extension to Feb. 22 because Gov. Ned Lamont will be presenting his budget Feb. 20. “This will allow me to have a better understanding of the state revenue side,” said Sciota. Sciota said the governor normally presents his budget on Feb. 6, but Lamont, elected last November, had also received an extension. The meeting was attended by Webelos Pack 72, who led the Pledge of Allegiance. 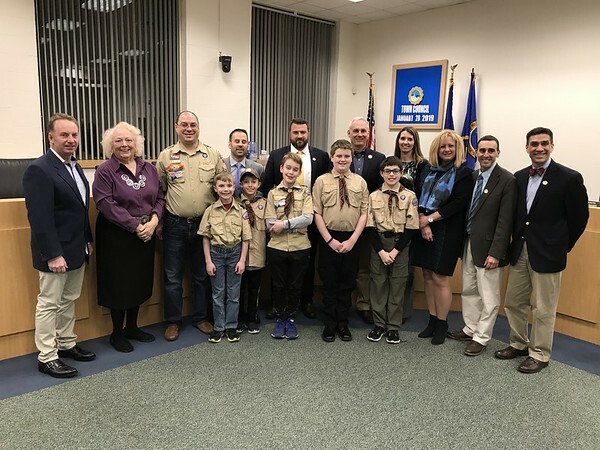 Councilor Dawn Miceli explained that the Webelo Scouting program requires Webelos to come to a government meeting to learn about local government. Posted in The Bristol Press, Southington Herald on Monday, 28 January 2019 21:06. Updated: Monday, 28 January 2019 21:09.